We’re big fans of the real, acoustic-driven sounds coming from Brothers McClurg. 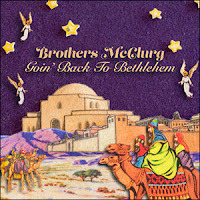 On November 27, they released an album called Goin’ Back To Bethlehem. This Christmas album will be featuring a collection of brand new material as well as revisiting some old standards. By combining the musical expressions of Around The Mic and Home, the Brothers put forth a record that is bound to become a classic Christmas treasure for years to come.